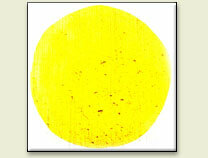 An opaque yellow with good covering power. It's a Lead-Tin oxide, discovered in the 13th and used until 18th Century, but most common from 15th to 17th centuries. Commonly used in foliage with green and earth pigments. There are two type of lead tin yellow, type I and type II. Type I is lead-tin oxide and is most frequently found on old paintings. Type II is a second variety of lead-tin oxide that may contain free tin oxide and additional silicon. Possibly both types were used as opacifiers in ancient glasses. Lead-tin yellow (type II) is produced by fusing lead, tin, and quartz compounds at about 800° C, yielding a yellow lead glass pigment that is ground and screened through a fine mesh. Although lead-tin yellow frequently occurs in European painting before the eighteenth century, it is not mentioned in older literature on painting techniques. 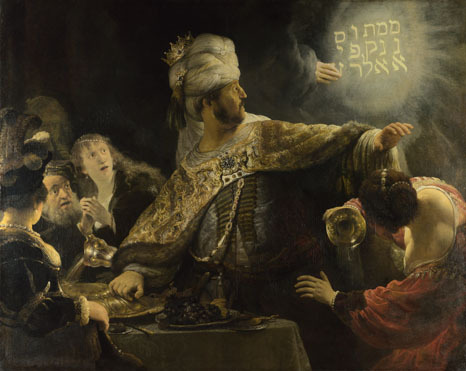 It has been identified in Rembrandt's work such as Belshazzar's Feast (1636/1638). Rembrandt's source for this painting, the Old Testament Book of Daniel, tells of a banquet Belshazzar, King of Babylon, gave for his nobles. At this banquet he blasphemously served wine in the sacred vessels his father Nebuchadnezzar had looted from the Temple in Jerusalem. Rembrandt shows, using lead tin yellow for the lettering, the moment when a divine hand appeared and wrote on the wall a phrase only Daniel could decipher: 'God has numbered the days of your kingdom and brought it to an end; you have been weighed in the balances and found wanting; your kingdom is given to the Medes and Persians.' That very night Belshazzar was slain.